Are you looking for information on the company Shenzhen Kinstone Develop Co Ltd located in Guangdong China who sells 4G Tablets? If so, read below to read one buyer’s experience with this company. 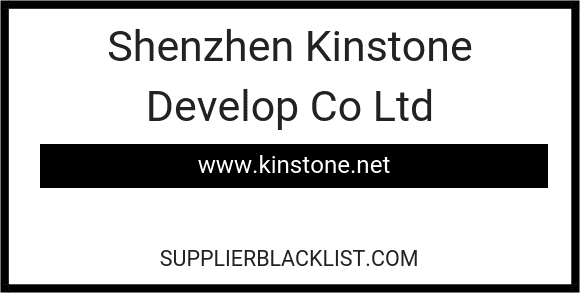 Also you will find related search links to explore more about Shenzhen Kinstone Develop Co Ltd on Supplier Blacklist and across the web. I met with the company during the HKTDC Spring Fair in Hong Kong, later on they came to our country as they were visiting clients all over, we talked to them and were interested in buying their tablets (we agreed upon 1000 pcs), everything was normal in the beginning, then during production some things were odd, like the fact that they took forever to send us pictures, we had set a time for shipping (30 days) which they agreed upon when we signed the proforma (which worked as a purchase order). Then, the guy who represented the company (Andy) started to lie about the end date, he asked for an extra week which we gave and then I asked him to stop lying and tel the truth, he gave us an end date and we made shipping arrangements for that, when the time came they were short on 100 pcs, all of this was after we made the last payment when they assured us production was done, our agent saw all boxes piled up and revised a batch which was OK, but it wasn’t, 900 pcs left the port and we asked for a refund of 100 pcs which they refused many times over, we end up accepting them shipping us the 100 remaining pcs and they paying insurance + freight (which was less than USD 100). Upon arrival, we noticed that there were 95 pcs and not 100 when confronted they say that they have the remaining pcs, with no apologies, and that they would send 4 as they sent one before for testing, which was an even bigger lie, on many mails that piece was named as a sample, not a piece from production, it wasn’t even the final product as it had no brand nor the final OS. Sincerely, I think we took all foreseeable measures but sometimes this things just happen. Also, I have WhatsApp conversations and mails if someone needs more info, I can’t attach mails and don’t know how to lower the size of the screenshots. Need More Info on Shenzhen Kinstone Develop Co Ltd? If you need more information, you can click the below links to search for more submissions about Shenzhen Kinstone Develop Co Ltd on Supplier Blacklist as well as go to the search results page on Google for more reviews online about this company. Perform a Supplier Blacklist search for more reviews on Shenzhen Kinstone Develop Co Ltd.
Search Google for Shenzhen Kinstone Develop Co Ltd Reviews.